As with the Prix du Jockey Club, young talents have to take the 2100m distance test in the heat of June. 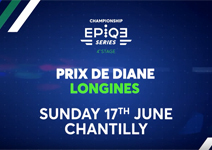 See you on Sunday, June 17th, at the Prix de Diane Longines in the fervor of the Chantilly Racecourse, which will welcome more than 40,000 spectators! The event is known worldwide: the Prix de Diane Longines is the experience of a unique sports day whose winners will be offered a place for the Qatar Arc de Triomphe.